Following SG-1's visit to P3X-888, the homeworld of the aboriginal Unas, Daniel continued to observe and study the Unas race, particularly the one known as Chaka. When his video footage shows Chaka being captured by men from off-world, carrying Goa'uld weapons, and taking him prisoner through the stargate, Daniel convinces SG-1 to follow. There they discover a world where Unas are domesticated as slave labor. Burrock, a slave trader, explains that generations ago the beasts had enslaved his forefathers, in service to the Goa'uld, but there had been an uprising, and in the bloody Beast Wars, the masters had become the slaves. O'Neill and Daniel hope to recover Chaka peacefully, and present themselves as dealers of Unas, proposing a trade. However Burrock recognizes the value of his captured slave and refuses a trade, even when Chaka recognizes Daniel and calls him by name. Hoping to avoid a confrontation, O'Neill and Daniel return at night to break Chaka out of the cell where he is imprisoned, however Chaka refuses to leave without other captured Unas. The delay alerts Burrock, who captures O'Neill and Daniel and imprisons them as well. He uses torture for information, and it becomes apparent that no peaceful compromise will provide a solution. Carter and Teal'c have remained outside the village, keeping in contact by radio and awaiting orders to initiate a rescue. They create a diversion, and break into the cells, releasing their teammates and three imprisoned Unas, who all escape toward the stargate. There they encounter several villagers, and in a bloody skirmish, Chaka kills Burrock. He is free now to return home, but he refuses to leave through the gate. Knowing freedom, Chaka makes the conscious choice to remain behind and to fight to free the other enslaved Unas, bringing a possible return to the planet's Beast Wars. 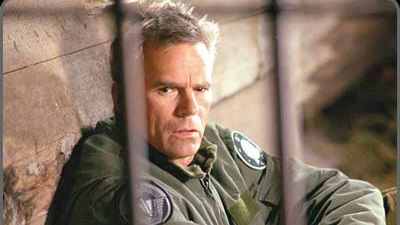 Daniel returned regularly with SG-11 to P3X-888 to reset a surveillance camera and leave an energy bar for Chaka. He used the footage to study the Unas social structure, culture, and identified up to 70 words of their language. Generations ago, the Unas served the Goa'uld and enslaved the population of the planet through terror and oppression. When the Goa'uld left, the humans learned to use weapons and led an uprising against the Unas. The Beast Wars lasted many years, the slaves became the masters, and the masters became the slaves. The symbols for P3X-888 are the only symbols known to Burrock. They are highly valued and were passed down through the lineage of certain families since the Beast Wars. The torture device is referred to as a "firestick". Daniel and Chaka speaking in the cell: Aka na. Ma. Ma kan. Kan cha na! Speaking about not killing, as Chaka prepares to leave: Ska nat. Ka keka.